From decorative garden fencing to something more robust and security conscious, we will fabricate and install the ideal fencing for your property. Metalwork fencing has always been the ideal solution for clients wanting classic good looks or modern minimalism combined with the best possible security for any domestic or commercial property. We design and install all kinds of fencing for clients across Kent, London and the South East, guaranteeing pre-galvanising for superb weather resistance, quality fabrication and finishing any way you want. Our metal fencing is one of our many services that we provide at Moss Fabrications. We have completed custom metalwork to many domestic and commercial customers alike to provide them the best in metal fabrications. We will provide you with the best in metal fencing to any household or property over the areas we cover; just call us on 01233 633 299 to talk to the metalwork experts. We also fabricate a wide range of more decorative domestic fencing for homes and gardens of all sizes. Be it a purely decorative waist high design or a more robust and secure high spiked design, we offer a range of standard models that are quickly manufactured in our own Ashford workshop, finished in any colour you choose and professionally installed. 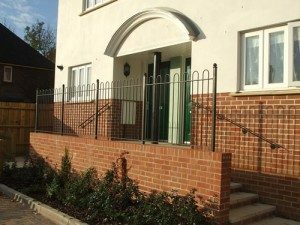 We offer a range of pre-galvanised steel commercial fencing in a range of designs. Fabricated to withstand the weather, provide a solid barrier and prevent climbing through security spikes and no-footholds design, our commercial metal fencing is ideal for any commercial property wanting simple, practical security. From office car parks to freight yards and industrial estates, we have got your commercial fencing needs covered. Some properties have very specific requirements that can’t be met by a standard design and some property owners have a very specific aesthetic idea they want incorporated into their garden fence. We comfortably satisfy both needs with our bespoke design service. Offering a full CAD studio support, we turn ideas into reality, quickly and cost effectively.